Welcome artists! As you make your summer event plans for 2019, we would like to invite you to join us for the 25th Annual Eagan Art Festival on the grounds of the Eagan Community Center in Central Park. Amenities include driving in to your booth space for set up and take down, hospitality, and booth sitters each day. The festival grounds are beautiful and centrally located at 1501 Central Parkway, off Pilot Knob Road in Eagan. See the map for further directions. This free festival will feature fine art and original handmade crafts, as well as tasteful music, children’s art activities, a variety of food, art demonstrations, and ample parking. We project 13,000 plus patrons annually. 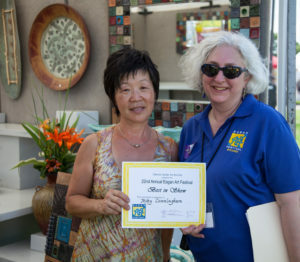 We expect the 2019 Eagan Art Festival to continue to be one of the most well attended events in the area! As you apply for the festival, please note the postmark deadline for (Link) applications is April 2, 2019. Be sure to read the (Link) Artist Regulations linked to the on-line application form or in the pdf featured on this page. In addition, a Minnesota State (Link) ST19 form is needed for the festival and the sales tax is 7.125%. Applications are available at the end of January! You can apply on-line or download a pdf from the artist menu.